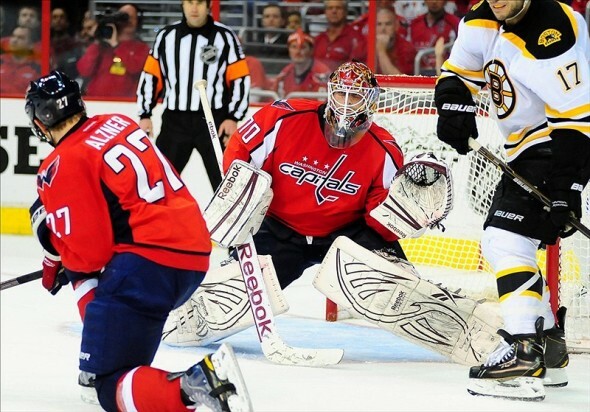 Is Braden Holtby the Capitals Goalie of the Future? When the 2011-2012 National Hockey League season started, the Washington Capitals would have never guessed that they would be in the circumstance that they are in. They probably wanted, and even expected to be playing game seven to advance to the conference finals. They probably would not have guessed that Braden Holtby would be minding the nets. Over the past few seasons the Capitals have had goalie issues, and many felt that problem was solved last summer when they acquired veteran Tomas Vokoun from the Florida Panthers. The play of Vokoun did not live up to the teams or fans expectations. He played in 48 games, winning 25 games, and posting a .916 save percentage. These numbers are not terrible, but the expectations for Vokoun, and the Capitals team was very high. He did not meet expectations, and either did the Capitals. The Caps back-up Michal Neuvirth also saw his share of games, he played in 38 games, winning 13 of those. Then came the part that no one can predict, injuries. When both Vokoun and Neuvirth were faced with injuries, a guy named Braden Holtby was catapulted into the starting position. Holtby is a twenty-two year old goalie from Lloydminster, Saskatchewan. He was selected 93rd overall by the Washington Capitals in the 2008 NHL Draft. He has spent the last few seasons minding the nets for the Hershey Bears. Prior to that he played in the Western Hockey League for the Saskatoon Blades. He played 167 games for the Blades winning 82 of those games. After a successful career in Saskatoon he moved onto the Hershey Bears of the American Hockey League. In Hershey he played 107 games winning 62 of those games. Although Holtby played numerous games at the junior, and AHL level, his experience in the NHL is limited. In 2010-2011 Holtby was called up for a short stint with the Caps. He played fourteen games, and was very impressive, winning ten. When the Capitals brought in Vokoun the hopes that Holtby had of being a regular with the Caps this year were diminished. He did not get called up at all this season until the injuries took place. Late in the regular season Tomas Vokoun suffered a groin injury, and Michal Neuvirth suffered a leg injury. Holtby was then called on to lead the team down the stretch, and into the playoffs. Holtby played in seven regular season games, were he won four of those. As the playoffs started many wondered if the 22-year-old net minder had the experience, and confidence to lead the Capitals deep into the playoffs. Holtby’s playoff performance has silenced the critics. His steady play in net has been the glue that has held this Washington team together on this crazy playoff ride. As the Capitals prepare for game seven versus the New York Rangers many people wonder what the future holds for Holtby? What will happen in net for the Caps next season? There is many questions that have to be sorted out. Many expect that unrestricted free agent Tomas Vokoun will be moving on. The same will probably be in store for current back-up Dany Sabourin who is also an unrestricted free agent. That leaves Michal Neuvirth who is signed though 2012-2013, when he becomes a restricted free agent. It also leaves Braden Holtby who has one more season on his contract. Prospect Philipp Grubauer is also in the mix. The 2010 fourth round pick of the Capitals has been playing in the ECHL for the South Carolina Stingrays. He has progressed very well, and looks to be a important part of the Capitals goaltending future. The longer Holtby carries this team in the playoffs, the more difficult it will be for the Capitals to not have him starting in net come next season. It looks like the Holtby has proven that he is a NHL quality goalie. Time will tell if he is Washington’s long-term awnser in goal.